What a nice surprise - used to be a bit of the ugly sister of Henley but has now blossomed into a friendly pub with an eclectic selection of drinks, a specialist pie menu (not tried) and a friendly crowd of locals. Forms and interesting trio of pubs in a very small area with the Row Barge and the Brew Hse - something for everyone. As mentioned in previous posts under new management, very friendly couple now running the pub and they actually knew our group of 11 were coming because they'd seen it on Facebook! Some interesting local real ales kept in good condition. Good standard of decor and a very comfortable place to relax. This pub is very close to the amazing, recently opened and hopelessly packed Henley Brewing Company, this pub compliments it and is a good alternative for a quiet drink. Good no frills pub with a friendly couple. 2 ales on, both interesting - very nice Windsor & Eaton Windsor Knot. The Victoria lost their licence in early 2012 after a long series of problems, and has re-opened in Dec 2012 under new management. The name is changed to The Queen Victoria, as part of the refit which has given them a new paint job and a modern interior, which arranged in a "U" shape around the central bar. The seating ranges from stools at the counter through table and chairs to some nice leather sofas. Apart from the usual range of modern lagers, they have four tapes for ale and carry three during the week and four at weekends. There is of course also a selection of spirits and wine. I haven't tried the food yet. Prices are typical for Henley/the south-east. 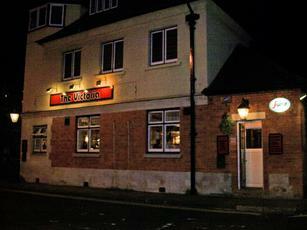 Based on two visits it is a good, local drinking pub with friendly staff. Newly refurbished and now The Queen Victoria - good selection of ales (not Brakspear!) much improved!